We have all Tim Griffin post for you today. Generally, I think Sir Griffin does a fine job operating his blogs within the confines of the WWL. In fact, I really enjoyed the research he did for a post just yesterday in which he found that attendance across the Big XII is at an all-time high. As a Kansas fan I was extremely pleased to see that as a percentage of seats they were third, behind only Nebraska and Oklahoma. Granted, this still left them in 7th on straight attendance, but when you’re 10th in capacity, what can you do? Steve from Kansas City writes: Tim, I saw something in your chat last week that I wish you would expound on. Somebody asked you what your favorite stadiums were as far as game-day experiences. Could you give me a full list and how you rank the Big 12 schools? Tim Griffin: I'll try. To be honest, I don't think there's a bad stop along the Big 12. I can legitimately be excited about watching a game in any stadium in the league. But that's just how I am, I'm easily satisfied. But if you asked me to come up with a critical list, here's my rankings. 1. Texas A&M: Unmatched atmosphere from fans. Kyle Field reeks of tradition and it's always been that way -- whether the Aggies were good or not. 2. Texas: The best of everything in press box accommodations and other creature comforts. 3. Oklahoma: What they are missing in plushness, the Sooners' stellar sports information office makes up for the rest with their dedication. 4. Nebraska: Memorial Stadium has the best "big-game feel" in the conference. The excitement is palpable in a walk around the stadium before the game. And I also loved the grilled sausages sold by the vendors outside the stadium. Kind of reminds me of walking into a Boston Red Sox game at Fenway Park. 5. Colorado: While I might struggle getting used to the altitude, Folsom Field has a picturesque quality that sets it apart from most stadiums. 6. Texas Tech: It's the only game in town and you can tell it with the excitement generated by Mike Leach's recent success. The Tech athletic people also make you feel like a long-lost friend when you arrive. 7. Oklahoma State: You never know what will happen in the interview room after the game here. 8. Kansas State: The best tailgating in the league and a nice comfortable press box. Who could ask for more? 9. Missouri: After a couple of early trips there a few years ago, I wondered if Faurot Field could ever be exciting. Chase Daniel and Jeremy Maclin are changing those perceptions pretty quickly. But I don't like driving there -- from either St. Louis or Kansas City. 10. Baylor: One of the most hospitable places to watch a game -- at least when the press box is closed rather than open for a hot summer afternoon. Sportswriters will always vote for cool air over football pageantry any day. 11. 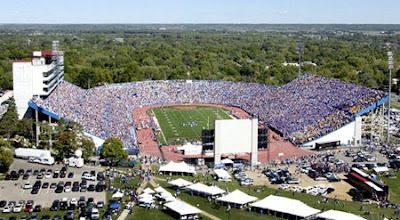 Kansas: Mark Mangino has pumped more life into Memorial Stadium than I ever could have imagined. But it still feels a little sterile at times. 12. Iowa State: The smell of brats and hamburgers wafting from the tailgaters makes Jack Trice Stadium's press box the most appetizing place. Now if Gene Chizik could only develop a competitive, contending program. Now, I haven’t been to all 12 stadiums and I’ll be shocked if I ever see Waco in this lifetime or the next. Because of that, I won’t try to contend his rankings, as wholeheartedly as I might disagree. What I will do is blatantly call him out for his ranking/justification of Kansas’ Memorial Stadium at 11th. Per his description it would seem very reasonable to believe that he used to attend games in Lawrence on occasion, never once enjoyed them, but in the last couple years he has found himself liking it much more, just not quite on the level of the traditional powerhouses. Fair enough. Another couple quick notes on his rankings… is OSU at 7th solely because of Gundy’s rant? Only Baylor currently fills less of their stadium as a percentage…Speaking of Baylor, are they 10th because the people in the press box treat him nicely? You’re in Waco and only 60% of the stadium is full! Who cares if the staff is nice, you're there for football and entertainment. I think you also need to consider some of the other factors he is weighing in...that being what a reporter would consider nice about a stadium rather than the average fan. In many of those rankings he puts some value into the press box amenities, athletic department kiss-assing and so on. He seems like a pretty fair guy when he ranks stuff like this and I will give him the benefit of the doubt in assuming that maybe he just didn't find the pressbox all that nice or something along those lines. I'm not too worried since I am sure that he has an entirely different experience than that of someone who sits next to the student section and runs out to grab a halftime beer. Agreed, And to be honest, I could care less what he thinks. I just find it funny that he says what he sayd when I'm all but certain he hasn't been to a game in years (if ever). And by sayd I mean "said." I did not see a mullet in this post what gives? My apologies, had an all day golf tourney yesterday and ended up forgetting it was Wednesday. We'll get a belated one posted momentarily. "You’re in Waco and only 60% of the stadium is full! Who cares if the staff is nice, you're there for football and entertainment." He gave Baylor that ranking because last year in Waco the staff was the entertainment. There was no football. As much as I like and respect Griffin, I doubt any "professional journalist" gets to partake in some of the ummmm, pre-game fests. I've been to most B12 stadiums/cities (marking Baylor off this year). Ranking the entire football environment for me, in order (missing College Station and Wacko); Boulder, Austin, Columbia, Lincoln, Lawrence, Norman, Stillwater, Ames, Manhattan, and Lubbock. I think 3-7 are debateable in their order, but definitely Boulder and Austin have to be 1-2 in city beauty and football environment. I'm biased towards Columbia, but wouldn't put it in the top two. Norman just doesn't do it for me like others. Agreed and I certainly handicap him for that. It was just a weird list... on the one hand he's praising A&M for the atmosphere and on the other he's notching Baylor up the list for being "hospitable." Long story short, there's no game this week and I'm getting restless. Last night's Beaver triumph has me content for now though. I didn't realize kU was off too. I guess the Huskers get all my hate this weekend.